Sorry for the Hiatus, I have an excuse! Also, we just had an adorable tiny human enter our life, so that’s going to make both playing EDH and writing about EDH pretty difficult for awhile. I am going to try to catch up though. I am building her her first EDH decks though! Updates Soon. Tapped-out Nearly Complete! I’ve played the first new deck in awhile, and I will do a write up shortly… If all goes well I’ll have a new deck per week for October (With a theme!). Also, all but TWO of my active EDH decks are now in Tapped Out. So, I haven’t played any new decks in several weeks, but it’s not for lack of trying. I’ve been starting decks and not being able to finish them, either for lack of creative theme or for temporary lack of funds to complete them. HOWEVER, I have been playing A LOT of games on MTG Forge which has also meant that I’ve really ramped up adding and updating decklists on TappedOut. I think I have almost 150 decklists up now. My goal is to have every deck up by Halloween and update this blog accordingly. The following decks are in various states of construction (not even including all of the decks that have been sitting partially completed for a year or more). Joven and/or Chandler (make other stuff artifacts). and still working to finish Lady Evangela, Karrthus, Sidisi and others. I’ve gotten a bit behind on posting game updates, but I’m getting closer to game 200. It’s been tough to find time to post here recently, but I do have some big things planned (if I can find the time). 1. I’m up to game 177, but due to news item 3, I haven’t had much time to update. I’ll try to get a few more written up soon. Highlights: Elves, Pauper (Gilder Bairn! Wooly Thoctar! ), Korra the False God, Rakka Mar, Medomai, Teneb! 2. My very first EDH deck — Kangee, Aerie Keeper — got some airtime on the Magic Homepage on a “Command Tower” article. http://magic.wizards.com/en/articles/archive/command-tower/commander-origins-2015-06-18 After playing it tonight, I realized that I added a few other new cards to it. 3. Tonight (6-24) was my last night playing at The Family Game store with a super awesome playgroup (short version: destroyed by Squirrels! ), as I am moving to Portland over the course of the next month. It’s been great playing there. If anyone knows of a great Commander / EDH group in Portland, Oregon, I’ll be looking for one (must be chill, not-hypercompetitive, and okay with me using occasional place-holder proxies. Thanks to GatheringMagic.com, I discovered the Tiny Leaders format. It’s like EDH (Highlander, a “General”) but Tiny (50 cards, Nothing with CMC>3 ) and I think it sounds AWESOME. It has a modified ban-list, and is meant to be played 1v1, but it’s not “French” EDH. There are a lot of cards that I have that I’d like to play with, but don’t really do much in the Big Mana, Big Dudes, Big Games realm of traditional Commander, and this format makes them worthwhile. It’s also something that can be played quickly, and a format where I wouldn’t feel bad trying to win fast (or play poison or counterspells). Obviously I’m not giving up on EDH — I should be to 150 decks sometime in the next few months — but I have a feeling that I’m probably going to build 25 (one for each color combination) or so Tiny Leaders decks as well. 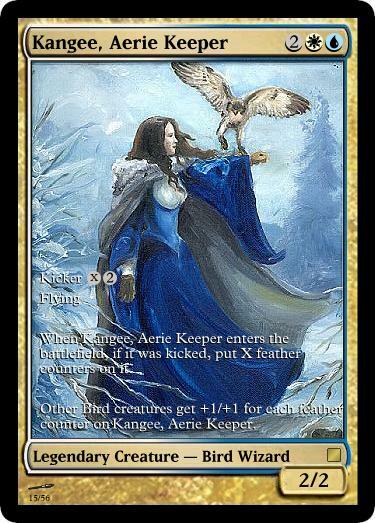 I’ve already built Soraya the Falconer as bird tribal (in honor of Kangee, Aerie Keeper, my first EDH deck), and Nin the Pain Artist as an instants/sorceries/prowess deck. Also, for my wife, I resurrected a modified version of my Animar Slivers deck. In the works, I’ve also got Rhs, the Exiled (Elves), 2 competing ideas for Glissa the Traitor (Poison or Artifact Combo), Thada-Adel (merfolk tribal). For those who may be missing my regular-EDH game reviews, I have a few more to write up, and I also intend on having decks starring Nahiri (Kor Tribal), Ghoulcaller Gisa (zombie-less zombie tribal), Titania (lands dying). I’m back from a long summer Hiatus. Due to wedding and Honeymooning reasons, not many decks were built over the summer, and most of the games I have played in the lase few weeks have been just for fun to reconnect with old decks. However, there are still new decks in the works, and at least two decks were completed over the summer. Hopefully there are still a few of the old readers out there, and maybe a few new ones.